I was reading an article the other day by a psychologist who posited the theory that social media may be responsible for the rise in depression and suicide. This psychologist wasn't talking about bullying, which we already know to have been ruled responsible in courts for several teen suicides. I'm talking about the myth of the perfect life that many of us are perceived to have based upon our posts on Instagram, Facebook and other sites. Let me first say that my own life is no more perfect than anyone else's. The reason that it may look that way on social media is that I was raised in an era when parents taught us that we should not "air our dirty laundry in public." That is, if one is having problems at home, personal, financial, or otherwise, one doesn't go around telling everybody one knows about it and one certainly doesn't publish it in the news media for strangers to read about or watch! In fact, I was told about the Victorian social norm that a "lady" should only have her name in the paper for three events: her birth, her marriage and her death. Anything more than that is a scandal. Imagine applying those standards to today's social media outlets. That early training possibly explains why I have mostly posted short, positive bits on Instagram and Facebook for the past few months. Not that anything serious was wrong or that I was depressed or anything like that. Between the demise and death of my father-in-law, Ed, in January and minor health mysteries of my own, I just haven't felt inspired to write on my blog. So, sorry to those who actually enjoy reading my musings on farm life and occasionally life in general. Mysteries solved, I'm fine and the past week has left me with so many sunny events to write about since, lucky me, my life has a lot to be thankful for. We have been so lucky to have been discovered by a lovely young woman, Cate, who had a strong desire to show alpacas at the Seneca County Fair for one of her many 4-H projects this year. She called sometime last winter and asked to talk with us. We got together with Cate and her mom, Joni, and discussed everything that would be involved in the project so she would fully understand the commitment. 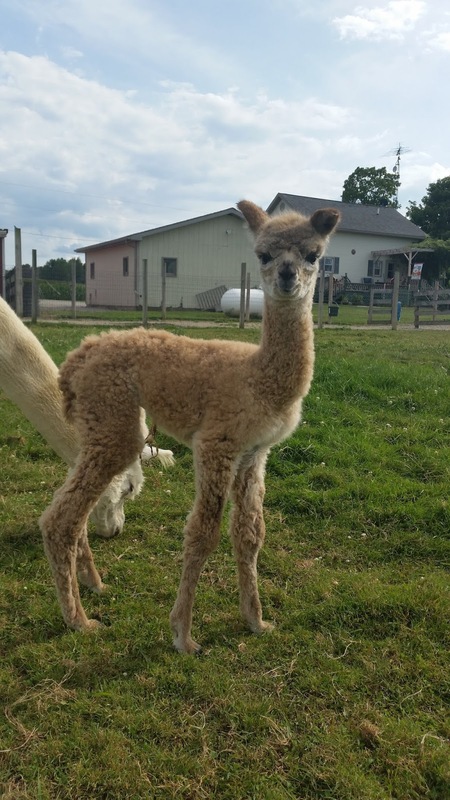 Then in April, Cate began coming out to the farm to learn about and work with the alpacas. 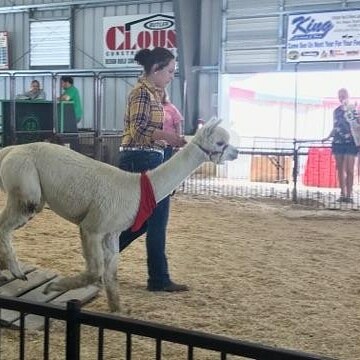 It's been a long process that I will talk about in future blog posts but this week it came to it's final end and she was the alpaca show at the fair. Last Sunday Rich and I loaded up Aristotle, who would actually be shown in the ring, and Dionysus, who was to be his companion. 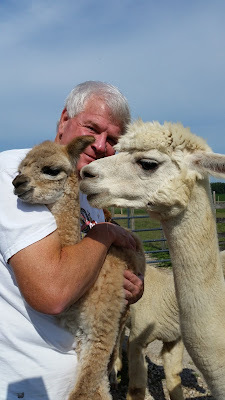 Dio was a necessity since they have such strong herd instincts and they would be the only alpacas at the fair. That's right, when I said that Cate was "the alpaca show" at the fair it wasn't a typo. She was the only one showing alpacas so I guess you know the outcome of the judging. She walked away with all the prizes! Seriously though, she earned every trophy and ribbon she won. Cate came out at least 4 times a week during the first three months to work with the animals. That meant a drive of 1/2 hour over and 1/2 hour home and a workout of at least an hour. In addition to this she was showing sheep and rabbits and babysitting. She came out on April 21 and spent the entire day helping us shear the animals. She was also a graduating senior with plans to attend the pre-veterinary course at Findlay University this fall. In addition to all of this she was last year's Seneca County Fair Queen and had many duties to carry out that were connected to that honor. We have so enjoyed working with Cate this season and are hopeful that this will result in having a few more 4-H kids come out to work with the animals next year, too. 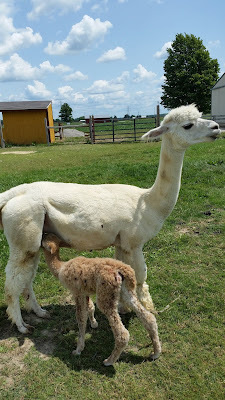 Mango had not only delivered her cria a week early (like she has her other two boys) but she gave us a girl this time! If that's not deserving of a blue ribbon I don't know what else is. After having six males in succession born on the farm we finally got lucky on the seventh one and got a lovely little fawn colored female. She was already up and nursing when we got home and was mostly dry. From this we estimated that she was born somewhere between 10:30 and 11:30 a.m. Mango, that wonderful mama, was standing patiently while horseflies swarmed all over her and let the little one nurse contentedly. Rich and I discussed names and decided to keep with the Greek mythology theme. Her name is Asteria which means star a name that features in several Greek legends. We didn't go back to the fair last night like we had originally planned. We just sat on the deck watching Asteria get her land legs as she explored the her new pasture world.